When Thursday May 8th rolled around I was 41 weeks and 6 days. I was so tired and achy, crampy and just plain miserable. I had really wanted to allow my baby to choose to be born on his own. I believed it was better, I just couldn’t take any more emotionally or physically. Joseph and I had talked about me needing to get more exercise. So he cheered me on via Skype from the top of the wheelchair ramp at my parents house as I walked up and down the ramp. Later that day I went for a mile long walk. Coming down the long dirt road that leads to my parents house I almost sat right down in the dirt and cried. Every foot step hurt and I was afraid this baby was never going to come out. I came home, got in a tub of warm water and had a long talk with my baby. The next morning I woke feeling even worse. Joseph skyped with me first thing and encouraged me to go walk the ramp again. I told him I just couldn’t do it. I was too tired and hurt too much. He encouraged me to do it just one time. I did it three times and was so proud of myself. As I walked back into the house a contraction started. It was however unlike the surges that I had been having for weeks. This one hurt! I was completely unprepared and it left me almost in tears. My sister-in-law was doing some office work for my mom who was out-of-town and she asked me if I was ok. I assured her I was it was probably nothing and then she asked me if I would check on changing flights for my mom who was desperately trying to get home in time for the birth. It was 11 AM. I went upstairs to get my phone to call my mom to get details and just as the phone was ringing another contraction hit. This one was worse than before and as I tried to talk to mother about her flight she could tell something was wrong. Vilate she said, you are in labor I can hear it in your voice. call your midwife right now. I called Rochelle and she told me to time the contractions for 15 min. and then call her back to let her know how far apart they were coming. As I got off the phone with her and got in the tub another one hit. The pain was so intense I couldn’t move I just hunched over the side of the tub in kind of squatting position and tried not to scream. I kept thinking that I needed to get in a comfortable position and practice the hypno birthing skills I had learned. My computer was on the counter next to me and I thought about putting one of the recordings on but the thought of any noise made me crazy. “What? I’m having a hard time understanding you she told me. I repeated my request. Again she couldn’t understand me. Finally, she said, ok I get it you are in labor! I will come right now. The door was locked so she had to find something to pick the lock and then she came in. She called my friend Jana who lived down the street and the two of them stayed with me, holding a bucket for me while I threw up and talking to me in calm soothing voices. I felt like I had lost all control and the contractions were running over me like a runaway train. Several times I tried to lay down thinking that if I could just get more comfortable I could relax but each contraction would send me bolting back into my squatting position leaning over the edge of the tub and burying my face in a towel. I asked Jana to call my sister Ruth. Ruth had been to quite a number of home births and I knew if anyone would be helpful as I waited for the midwife it would be her. I felt rather than saw her enter the bathroom. She breezed into the room in the down to business sort of way that only Ruth can and grabbed my head in both hands squeezing my forehead and the back of my neck. It was soothing somehow and made me feel like someone else was in control and I didn’t have to do this alone. She encouraged me to bring my voice to a low moan instead of screaming. About 1 PM my midwife’s assistant arrived. She got down by my face and started humming a low moaning kind of hum. I instinctively knew I was to copy her. It was hard but it gave me something to focus on and actually helped with the pain. I don’t know when Rochelle got there but I remember looking at her face as she spoke to me. I remember her telling me that I was going to get through this. My body had started pushing about this time and it wasn’t long before I felt/heard a little pop and there was a rush of water. A dark yellow and brownish fluid flowed out into the tub. This was familiar, this was finally something that I had seen in the countless birth videos I had seen. It meant progress, it meant the baby was coming. It was a small moment of joy amidst the pain of the contractions. I remember thinking how cool it was that this was finally happening to me! It didn’t take Rochelle long to see that the position I was in wasn’t the most ideal. I didn’t want to move but she encouraged me to get out of the tub and try the birthing stool. As soon as I was seated on the stool I knew it had been a wise choice. I felt I could handle the contractions better from that position. Ruth and Nat (the assistant) were pushing on either hip during the contractions and bringing me ice, monitoring the baby and doing who knows what else in between. Rochelle stayed in front of me holding my hand and encouraging me. At one point I started yelling “I can’t do this” over and over again. Nat looked at me in a calm and somewhat chastising sort of way and said. “You know what you are doing this. You are doing it right now so you can just stop saying that.” I knew she was right but I just would have given anything to get the pain to stop even for just one minute. I was starting to feel the outside world closing away. I felt like I was in a small closet like space, just me and my body. I could hear what was going on around me, I could feel people pushing on my hips, I could even feel myself standing on occasion and swaying back and forth but I felt a bit separate from it all, like I was living completely in my head. It was about this time that Renae finally arrived. Renae had planned to be there with me and had taken all the classes with me. 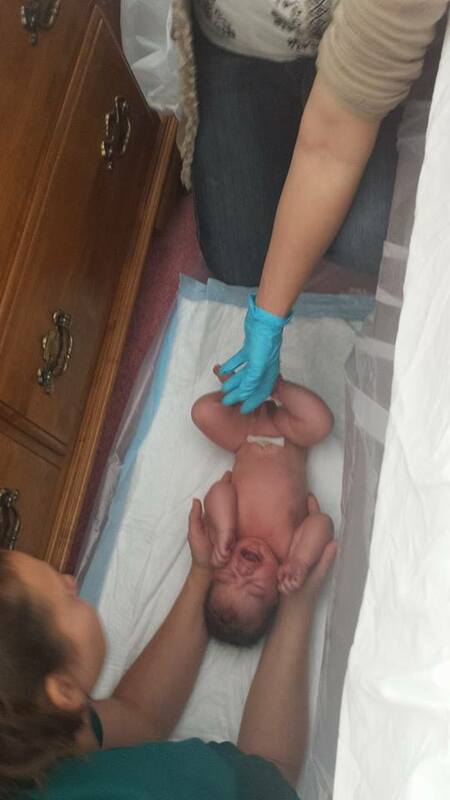 She was as prepared as I was for a nice, peaceful, quiet, water hypno birth. As she was leaving her house to come to mine she had grabbed a book on her way out the door thinking I might like her to read to me while I was in labor. She drove to the house and as she pulled into the driveway she imagined walking into my bedroom to see me in an all white night-gown resting peacefully as I breathed through the surges, the midwife knitting away in the corner. She rang the door bell and before anyone even opened the door she could hear me screaming. That was her first clue that she would not be needing the book she brought. She walked into the bedroom to see me sitting on the birthing stool a small puddle of blood under me on the floor. I was pushing and screaming and Rochelle took one look at her and said great you’re here push on that other hip as hard as you can. She was shocked to see no recognition at all on my face when she walked in. It scared her. But she was needed and had to go right to work. The coach in her kicked in and she started pushing me to do more than I thought possible. Finally Rochelle told me that the baby was too big to fit through my pelvic bones. “I’m going to reach inside and push those bones a part so that he can come through she told me. “If we want to get your baby out I need to help him” She told me. I nodded and with the next contraction I felt her hands working inside me to open those bones. I begged her to stop and I could feel a feeling of defeat settle in the room as the contraction ended. Nat was monitoring the babies heart and would periodically call out numbers. I noticed that the numbers were dropping. Each was lower than the last. I knew I had to swallow the pain and let Rochelle do her thing. Ok let’s do it I told her when another contraction started. She pushed, I pushed Ruth and Renae pushed and somehow with all the pushing the pain retreated. As long as I was deep in my body pushing with everything I had I could no longer feel the contraction. You can feel the babies head. It’s just inside” Rochelle told me. I felt but it didn’t feel like much to me. Just a slimy wet spot. Nat was monitoring the baby again. “There’s no tone” she said. Try a little lower Rochelle told her. He might just be down further. I didn’t feel panic, It wasn’t entirely clear to me what was going on. But I felt like I had reached the end of my rope and I wanted someone to just make it all go away. “Rochelle, I can’t do this. I begged please help me. Can’t we just go to the hospital? I felt like a quitter even as the words left my mouth. Rochelle was very serious. Yes, we can go if that’s what you want but if you let me help you we can get this baby out in a few more minutes. If we transport it will be extremely painful and it will be a lot longer before you get relief. Your baby needs to come out now. She told me. That was the moment when reality hit me. There was no way out of this. No one was going to come fix it, even the hospital couldn’t make it better at this point. I simply had to do it. I had to push I had to deal with the pain and I had to get through this right here and right now. Another contraction started and my world swirled away as I pushed and pushed, contraction after contraction came, and we pushed. I knew I couldn’t last much longer. Then suddenly I heard singing. It was quiet and peaceful. It was low and beautiful. The words to the song were encouraging the baby to come, to be born. It sounded like everyone in the room was singing. I wondered how they all knew the same song. Breathe for your baby Vilate I heard someone telling me and I took large gasping breaths through my nose. Someone put oxygen on me and some one was holding my legs. I was pushing and I could feel burning. I knew the baby’s head was coming out. I wanted to quit but I knew I had to keep pushing. I remember begging God to help me and thinking that it was strange that I would refer to him as anything but Heavenly Father, but that’s what came out of my mouth. Finally he was born and somehow I was lying on the floor instead of the stool. I was shaking and someone was putting warm towels over me. I kept asking for the baby. We had discussed that I would be the first to touch him, the first to hold him if at all possible. I wanted him on my chest as soon as he was out. Rochelle’s back was to me and I couldn’t see him, but when I started asking for him she turned and I saw blood on her face all around her mouth. She was leaning over the baby, her mouth covering both his nose and mouth and she was breathing for him. It registered that, that was a scary thing but I didn’t feel scared. Finally he took the tiniest of breaths and she put him on my stomach. He felt wet and heavy. I pulled him up closer to my face where I could see him. He was still kind of blue and not really moving. I knew I should be rubbing him and talking to him, but I was so tired. I remember feeling relieved that he was here but all I could really think about was the pain I was still feeling. You need to talk to your son Joseph I heard someone say. I heard his voice, sounding so far away. “Welcome to mortality, my son, he said and then he started to bear his testimony. As he did the baby started to squirm and make little noises. He started to turn pink. 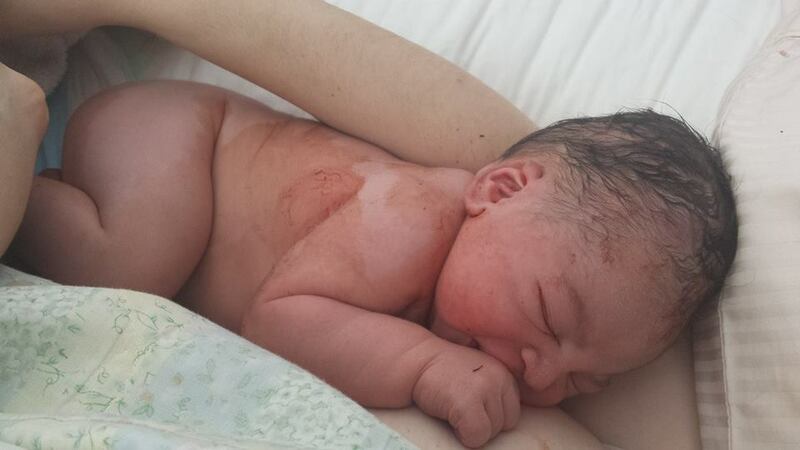 After the placenta came we put it in a bowl and everyone helped to move me, the baby and everything onto the bed. Once I was wrapped in warm blankets with the baby in my arms I finally started to feel like the little bundle in my arms was a baby. I looked him over, I could see blood on his head and on his side. His big eyes were just looking at me. His feet resting one across the other next to my belly. I held him and talked to him for hours while Joseph looked on over skype. Everyone left the room and gave us a few moments to enjoy our baby together. During this whole process Joseph had been pretty much left on his own. Occasionally when things were slow someone might explain what was happening or move the computer to make sure he could see but mostly he just watched quietly, prayed and wrote a letter that he would give me later. Here is a little of what he wrote. 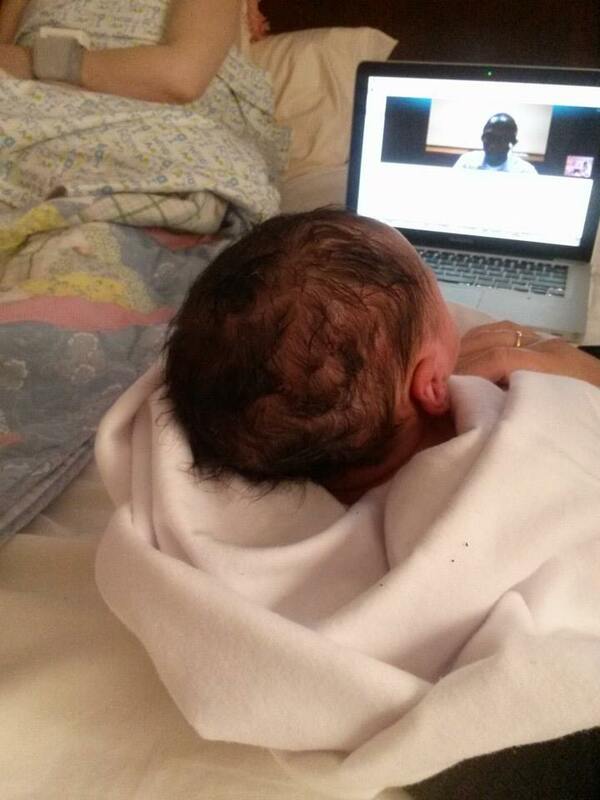 “Being with you on skype for several hours through labor has been incredible. I gazed at you not knowing what to say but to pray for you and the angelic Midwives that were VERY supportive in this process. I prayed for almost every second that the Lord would give you courage and believe that you can do it. Most the times in between, the only words I would say were “You can do it Vilate” I know you can, we are almost there. He is coming, you are doing great but all this, I wasn’t sure if you were hearing me. I LOVE YOU SO MUCH sweetheart. You had gotten tied and were asking to go the hospital but from no way, you received strengths to push from unknown source and the Midwife told you to touch the Baby’s head, which you did and you got more strength. Has you got closer, they told me he has dark hair and I smiled but a little because you were still in pain. Later he added these words and sent the whole thing to me as a letter of appreciation. “Today when I think about that day, I see everything throughout the birth being miraculous. The LORD was on our side and I am eternally grateful that everything worked out perfectly. When I saw our son after is born, he had lost his breath but I never noticed cause of the new sensation of a feeling to be a father finally. I have no words to describe how I feel from that day, but to be grateful to my wife. I love you so much honey, my love for you has been broaden through this all experience. I am grateful for the LORD who trusted us and granted us the opportunity to experience the miraculous creation of another human being. Our baby recognised his father from the very beginning and when we had to leave him on the bed for a few minutes, we turned the computer so that Joseph could watch him while the midwives were taking care of me in the other room. We heard him start to cry and then suddenly stop. When we came back in the room he was lying on the bed looking at Joseph on the screen while Joseph sang I Am A Child of God. It was so beautiful, I could have cried. I had a 4th degree tear and need to go to the O.R. to get stitched up. My sister kept the baby over night while I was in the hospital and brought him to me when I was released the next morning. It was a crazy adventure, one I don’t plan to repeat any time soon. I know Preston needs a little sister but she may need to wait a little while, while I put myself back together both emotionally and physically. I was a little “torn up” about how different this birth was from what I had planned for and expected. It may take me awhile to wrap my head around what happened and how I handled it. Somewhere between life and death there is a veil that separates this world from the spirit world. As I held my baby and realized that just minutes before he had crossed through that veil I realized that part of the birth process is allowing the mother to approach the veil, probably closer than she will be at any other time in her life. Close enough to reach through and take her child by the hand and help him to cross into mortality. Those moments when I felt so distant from everything around me, I believe were the moments that were the sacred beautiful parts of birth in which there is hardly any separation at all from the spirit world. I know there were angels there that day helping in the process. There were angels from this side of the veil who pushed me, held my hand and sometimes literally carried me through the process. But there were other angels too. Angels from the other side. I’ll never know what work they did but I felt them there. In the end it was all worth it. 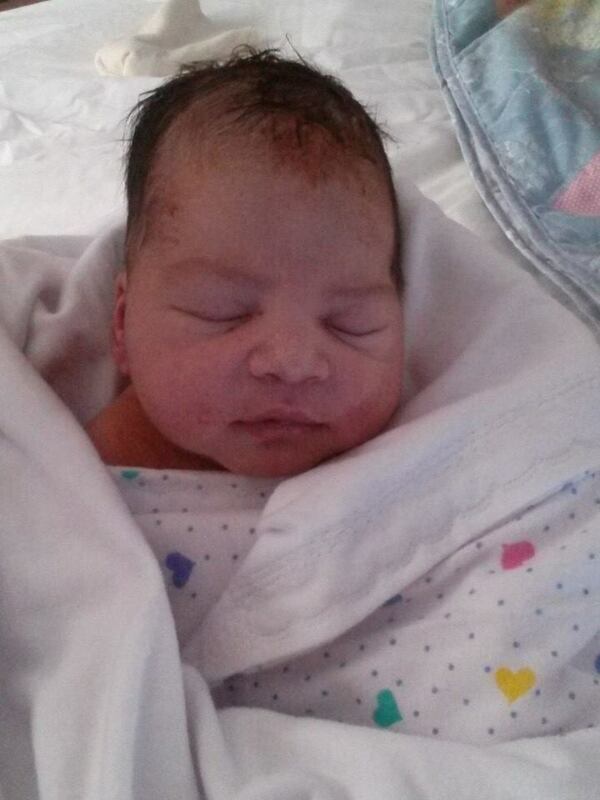 Baby Preston Joseph Ssempala born May 9th 2014 at 3:05 pm weighed 9lbs 5 oz. and was just over 21 inches long. His 14 inch head matched his 14 inch chest and he is pretty near perfection. He is alert and starving pretty much all the time. He is my world and I love him to distraction. 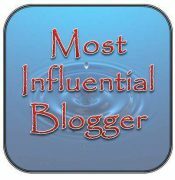 This entry was posted in Childbirth, Inspiration, Uncategorized and tagged 4th degree tear, home birth, hypno birth, midwives. So glad I was there to share this experience with you. Becoming a mother is a sacred rite of passage that is such a gift to partake of. Love you sister. What a powerful description of such an indescribable experience. I love you, Vilate. So happy for your miraculous family.